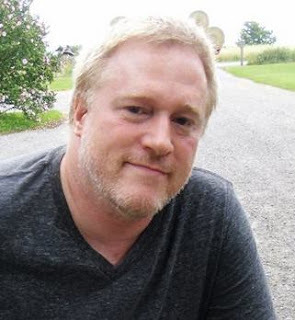 Gregory Lamberson the man behind the excellent cult slime filled movie 'SLIME CITY' as well as many other movies recently gave us a chance to interview him. In between asking about how his career has gone through changes we also catch up with what he is doing next. The first film I worked on was I WAS A TEENAGE ZOMBIE. I was the production manager on that, and had a small role. I worked on it for free, specifically to learn how to make a low budget feature. I'd already written the scripts for SLIME CITY and JOHNNY GRUESOME, but only had one year of film school under my belt and needed to understand the nuts and bolts of producing a feature. Who or what would you say has been your biggest influence on your career? For those who have never seen any of your films, what would you recommend people see first? SLIME CITY, even though it's primitive and I had no idea what I was doing when we made it. It's the first film I made, so why not start there? 'SLIME CITY' is probably your most widely recognised film but what been your most successful film financially? None of them have been successful financially. We got screwed by our first distributor for SLIME CITY, who subsequently went to prison after being convicted of murder. UNDYING LOVE and NAKED FEAR came out during a downward spiral for low budget films. SLIME CITY MASACRE was ineptly released by a different distributor than I normally use, but it will find a new life next year. DRY BONES is still finding an audience. These are all micro-budget labors of love, and I never made a dime on most of them. What made you want to make a sequel to your cult classic 'SLIME CITY' and will we see another sequel in the future? I gave up on filmmaking after NAKED FEAR took five years to complete and never made a dent. When digital filmmaking became a reality, I decided to make SCM for two reasons: first, I wanted to prove to myself that I could make a good film, and second, I had a lot of ideas about doing a crazy, semi-science fiction sequel to SLIME CITY. The result is a love letter to the low budget subgenre SLIME CITY belongs to as well as several SF films I grew up loving, like PLANET OF THE APES. I also thought it was funny to make a character modeled after Donald Trump the villain, and that was back in 2009. Watching your films is always interesting if not just for the execution but to see who pops up in them. You notably have a few actors appearing in your films that have been in others of yours. Is this an intentional casting choice or do you have people you just enjoy working with? This was due more to the "Hey, kids, let's put on a show!" mentality than anything else. When ypou can't afford to pay people, you draft your friends. 'UNDYING LOVE' was your next film following 'SLIME CITY', was it your intention to make a smaller scale film after the sfx heavy 'SLIME CITY'? Yes. 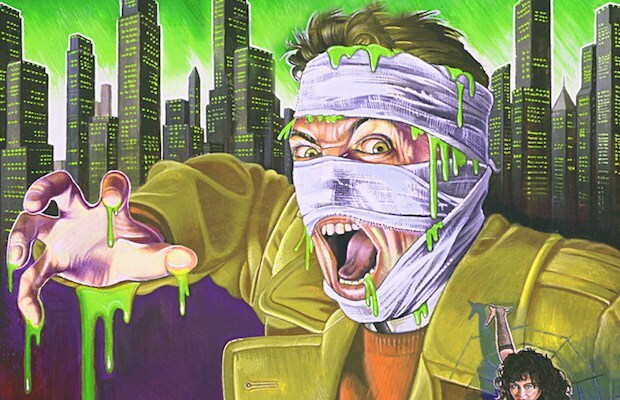 SLIME CITY came out at the tail end of the 80s video boom. We were one of the last micro-budget horror films to earn an advance from a video distributor. So you had to make 'em cheaper, and I wanted to do a more character based film. It's a deconstructionist vampire film with noir overtones. Until SCM, it was my favorite film. I would compare 'UNDYING LOVE' to George A. Romero's film 'MARTIN in terms of tone, was you at all aware that people would see comparisons between the two films? MARTIN was definitely the key inspiration, right down to the razor blade imagery. 'NAKED FEAR' is much like 'UNDYING LOVE' in being on one location most of the film, was this mainly down to budgetary constraints? No, that was conceptual. I wanted to tell the story of a guy who suffers from agoraphobia and never leaves his apartment, and I also wanted to do a thriller take on THE ODD COUPLE pitting the star of SLIME CITY against the star of UNDYING LOVE. In 'SLIME CITY MASSACRE' there is a scene where the two main guys are looking for supplies and they come across a recognisable basket with a certain bottle of drink in it. Was this your way of adding a nod to other films similar in tone to 'SLIME CITY' or just a thank you to fans? Both. BASKET CASE, STREET TRASH and Troma are all from 'my era' and I wanted to make a film for the fans of those films as well as my own. You made a fine film in 'DRY BONES' that some (including me) would say is a homage to 1980's horror films. How did working on this film compare to say 'SLIME CITY MASSACRE'? It cost less than $15,000, and we had a very small crew. It's thematically similar to SLIME CITY except with a middle aged man rather than a college student. You co-directed 'DRY BONES' with Michael O'Hear, how did you split directing duties with each other and was it difficult at times? No. Michael hired me to write the script for him to star in and direct. I thought the script turned out so well that I decided to produce it just to make sure it actually got made. Then I decided to kind of ghost direct it as far as the camera angles to make sure it got finished, to protect our investors. And then Michael got really, really sick - he was in pain for most of the shoot, and had his hands full just acting in it. So I took over directing it from the first shot on the first day. I directed all of it, but we cast it together and he rehearsed the other actors, not me. Your most recent film 'KILLER RACK' stars the ever reliable Debbie Rochon. You would later rejoin her on her directorial debut 'MODEL HUNGER' what has been your favourite experience working with her? 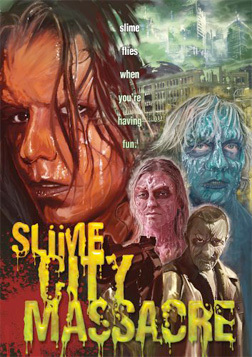 SLIME CITY MASSACRE was a special experience, and she was a big part of that. She really set the bar, and she's so talented. She's great in DRY BONES too. And she's brilliant in KILLER RACK. She won film festival awards for all three performances. We also worked together on BATTLEDOGS, which I was 1st AD on, and on a Fred Olen Ray film, A MOTHER'S REVENGE, which aired on Lifetime. In amongst your time as a film maker you also helped start the Buffalo Dreams International Film Festival. Has this been a successful venture for you? On many different levels. I've met so many filmmakers through that festival, people who are peers and good friends. You are also a successful book writer, was this a medium you always wanted to work in? I flirted with the idea of being a novelist before I made SLIME CITY, and after the experience of NAKED FEAR, made it a reality. I've written 12 novels, 2 novellas and one nonfiction book. The advantage to writing a novel is I can tell the story I want to tell exactly as I want to tell it, without any budgetary or scheduling restrictions. Do you have any projects lined up and if so can you tell us any details? I'm halfway through shooting JOHNNY GRUESOME, my dream project since I was 19. It has a SAG cast headed by an up and coming actor named Anthony De La Torre who's going to be a big star, and Michael DeLorenzo from TV's NEW YORK UNDERCOVER and RESURRECTION BOULEVARD. I have a 30 man crew and a 30 person cast, and we're making something really special, a straight horror film and not a goofy horror comedy, with real production value and scares. This is the turning point for me, and it's been a long time coming. My six novel occult detective series The Jake Helman Files is being developed as a possible TV series by George Mihalka, who directed the original MY BLOODY VALENTINE in addition to many, many TV episodes and films, and Craig Sheffer (NIGHTBREED) and I are developing my zombie novella CARNAGE ROAD as either a film or series. So the best is definitely yet to come. Thank you for your time and best of luck with any future projects. We have reviewed several of Gregory Lamberson's movies and you can find them by clicking the relevant movie title below.